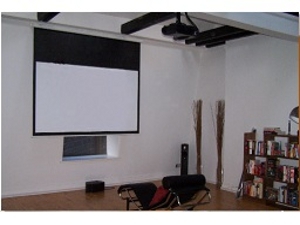 AV Installs Projector Screen Installation Service is suitable for all makes models and sizes of projection screen. Our expert engineers will advise on possible screen installation options then wall mount or ceiling mount the screen in a safe and secure manner using any specialist fixings required. Whether you have a permanent ceiling mounted projector or a projector that you get out for special movie nights having a screen installation will improve the image quality and your enjoyment. Screens for the home tend to be either wall mounted, ceiling mounted or recessed depending on location conditions and customer requirements. AV Installs specialises in big screen installs and has many years experience providing custom installations for domestic and commercial customers. AV Installs can also assist customers configuring the screen with the projector trigger control, third party remote controls, hard wired switches and home automation systems. All projector screen installations come complete with a full twelve month installation warranty and a customer satisfaction sign off sheet. AV Installs is a Northamptonshire Trading Standards Approved Buy With Confidence Member and only uses its own engineers which are CRB checked.